I’ve been meaning to write about water quality during pregnancy and water filters for a while now. 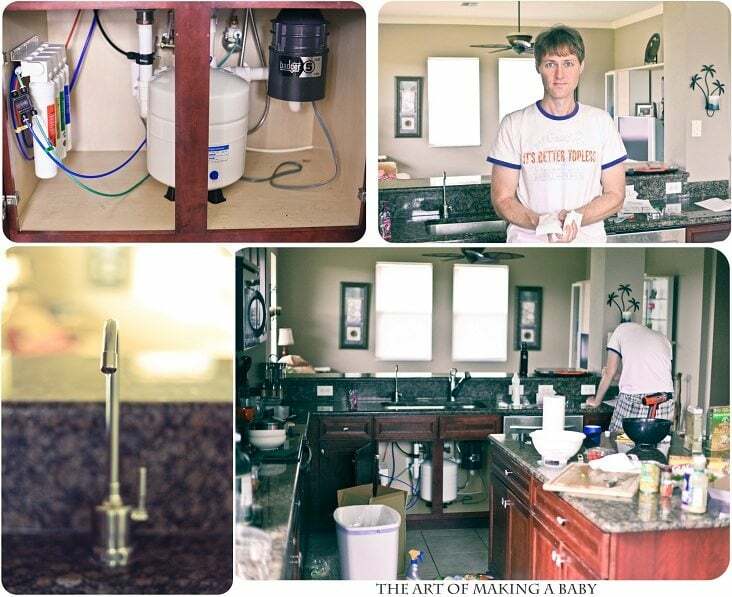 One of the first steps we took to avoid any toxic products once we found out I was pregnant was buy a water filter. We spent a few days researching what was in our water and any risks those low levels of contaminants can pose to a fetus as well the best and cheapest water filters that would remove those contaminants. See, most areas’ tap water contains THM ( by-product of disinfection, from what I remember), nitrates, and some even contain arsenic and lead. I pulled up the latest water quality report from our local water company ( you can also do that, or call them and they’d be happy to mail it to you). Everything seemed great in the report, the levels are well below the allow contaminant level. However there was enough there to make us want to take a precaution and buy a good water filter, rather than use an in-refrigerator one. After much searching hubby and I agreed on this one, since it removed everything, except for virus and bacteria, since it seems no filter that removes nitrates,arsenic,lead and such, also removes viruses and bacteria. It also removes cysts, chlorine and others. It took hubby about an hour to install it. It comes with a faucet, so he had to drill the granite to install the faucet which was easier than expected, once he got a special diamond drill bit. Of course, the water tastes fabulously, though the taste wasn’t our concern. Here are some of the photos from the install- we made a total mess in the kitchen while doing it, so don’t mind that. I’m so glad we bought it and now we have it for life. I think if it wasn’t for this pregnancy, we would never do it. But apparently, the contaminants are pretty harmful to children as well, so we are happy to know it’s there for our new baby too. We love our water filter too! But once baby is born, they will need fluoride even before teeth come in. From the research I did on our RO system, it removes fluoride. Our son’s pediatrician told us he needed tap water because of this. I would love to hear your thoughts on this. You know you bring up a very good point! I haven’t thought of it. What about cooking with tap water and drinking filtered water? I just give him a mix of tap and RO water. He is 10 months old. I make some of his bottles with tap (he is formula fed) and in his sippy cup he gets RO water. The myth that flouride is necessary for healthy tooth development is completely false! I have live 25 of my 27 years drinking purified water (sans flouride) and using flouride-free toothpaste (since I am allergic to flouride) without missing it a bit. Flouride is in the same family as Chlorine, both of which are highly toxic for the nervous system and produce hazardous by-products in our water. Further, I do not recommend RO as it removes needed mineral. A carbon filter, Yes, but RO, no, unless you have a higher than usual mineral presence, such as too much iron or magnesium or sodium. If you must use RO, opt to replace the minerals with a good ionic mineral supplement to counteract the mineral leaching effect RO water has on your bones and digestive tract.